Bursts of Greenery bring energy to a room. Pantone’s Color of the Year is a breath of fresh air. The color, “Greenery,” evokes thoughts of spring blooms and feels like nature itself. In general, it creates a feeling of joy and freshness. Greenery is the color of new beginnings and is the perfect way to start the new year: It revitalizes and renews. Of course, that’s what we look for every year but maybe even more so this year — it brightens and brings us together. With technology permeating every facet of our lives, many of us are looking to nature to reconnect, with each other, with ourselves and with our families. Even more, clients are intentionally trying to disconnect from everyday stresses. Families want to be immersed in nature while having quality family time when they are here, whether they are visiting for the first time or this is their go-to vacation spot. Instead of having a large-screen TV as the focal point in the great room or living room, clients are moving the TV out and color, art, an architectural feature or fireplace in. It’s welcoming and really changes the feel of the room. This is the essence of Greenery: disconnecting from the hectic and connecting to one another. Greenery can be used in many ways — if you’re as madly in love with the hue as we are, then go big. 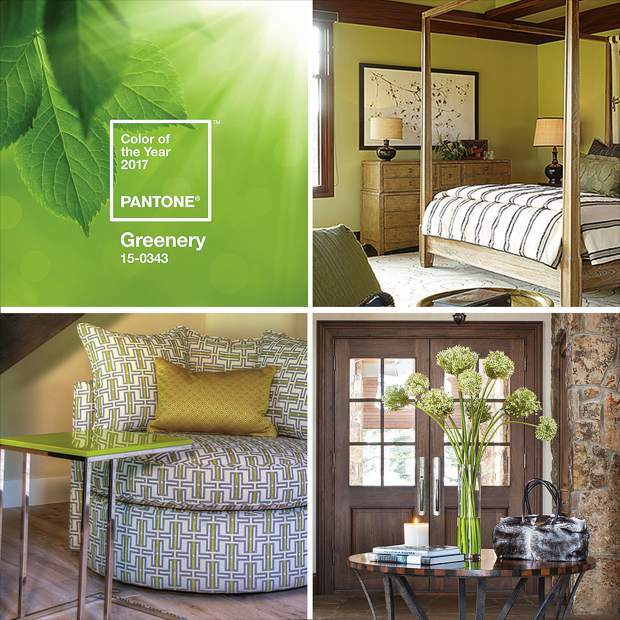 In case you’re thinking that sounds too bold, Pantone has dubbed Greenery “nature’s neutral.” Use Greenery on the walls. It’s an amazing backdrop to furniture pieces; it creates contrast and depth but doesn’t overwhelm since it’s a color found in nature. It’s calming — think of your favorite yoga studio. Chances are, Greenery plays a big role in the room. It’s a lively color, and it works well with other vibrant colors to add drama and energy to a room. Incorporate Greenery into furniture statement pieces, such as an armchair or love seat. Use this color in an unexpectedly different way: on a tabletop, inside of a cabinet or even on cushions on dining room chairs in small bursts that draw the eye and bring a smile. Use pillows, bright and subtly bold, to add colorful bursts whether on a bright white or dark gray sofa. Pair Greenery with neutrals — beige, gray, ecru — for a natural-feeling pop of color. The color envelops with a cheery welcome to the room. Greenery works so well in patterns, too. It’s one of those colors that can do so much in so many ways and elevates the mood. Use Greenery in patterns: graphic bolds or traditional herringbone. It breathes life into what could be staid. Greenery is the perfect choice to use in window sheers; the color is ethereal. When sunlight streams through, it creates a warm and energetic feeling in the room. One of the best ways to bring Greenery into your home is through plants or fresh-cut flowers. It’s the small indulgences that make life interesting and well designed. After all, a thoughtfully curated house feels like a home, one where guests are welcome and families thrive — naturally. Frances Karsh is a senior designer at Slifer Designs. She loves to work in unexpected pops of color in her designs.